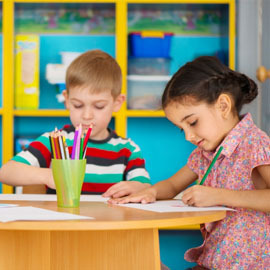 When it comes to a good preschool education, look no further than First Class Child Development to provide your kids with all of the tools they need to succeed. Open for children ages 3-5, our program is specifically designed to keep your kids learning all throughout the day in the way that makes the most sense for kids this age. After all, your children are turning into their own little people with their own personalities. We simply foster that growth, helping them to seek solutions to their problems as they make their way through the learning experience. With a focus on social studies, health, math, and science, our content is distributed through age-appropriate activities that encourage learning. If you’re interested in giving your kids a head start on their education and you’re searching for the best preschool in Houston, today’s post is for you because we’ll be sharing a bit about what you can expect from our child development program. Keep reading to learn more! One of the things that we say the most is that young children are constantly in motion and optimum learning occurs when they are allowed to move and choose their own play. 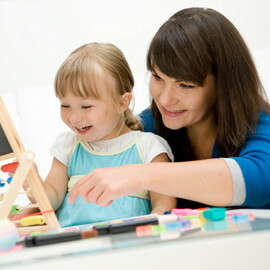 At this age, children develop understanding of concepts about themselves, others, and the world around them through. That’s why we’ll have your kids tackle tasks such as measuring out ingredients for cooking, sorting through objects, matching items, listening to music from all around the world, and using building blocks. Of course we also let them draw, paint, and play with play dough. In other words, it’s the perfect way for your kid to spend a day at our early childhood education center! What Do Your Kids Love the Most? For many children out there, story time is a favorite, and each child has a favorite. That’s why we like to approach story time in such a way that it gets your kids interested in reading and writing. One of the ways that we like to do this is by having the children label items around our classroom; another is that we have them draw and trace letters during drawing time. Other children relate strongly to music, enjoying spending their time with singing and dancing. We like to foster this behavior by encouraging kids to do what comes naturally. At the end of the day, the team at First Class Child Development likes to take the time to get to know your kids, encouraging them individually as well as fostering the perfect environment to learn in a group setting. Learn more about our preschool environment here, including information about our classes as well as items to bring with your children to class. Be sure to click here for general info about our school. In it, we cover everything from arrival and departure times (including how to sign your child in each day), meals and snacks, guidelines for guidance, our holiday schedule, what to do for medications, medical conditions, and illnesses, and how you can get involved as a parent. We particularly love it when parents get involved in our parent programs, and you should know that parents are encouraged to visit our school any time whether you’d like to participate, join us for field trips, or even share your skills with us. In other words, we believe that it’s important for us to partner with parents in order to provide children with the most comprehensive care possible. After all, at the end of the day the goal is to give your kids the best possible education! 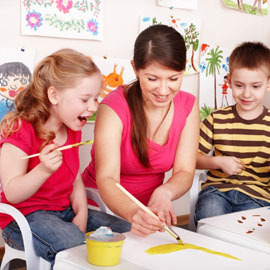 A preschool education is an important thing and we know the decision about where you’ll take your kids is a big one. 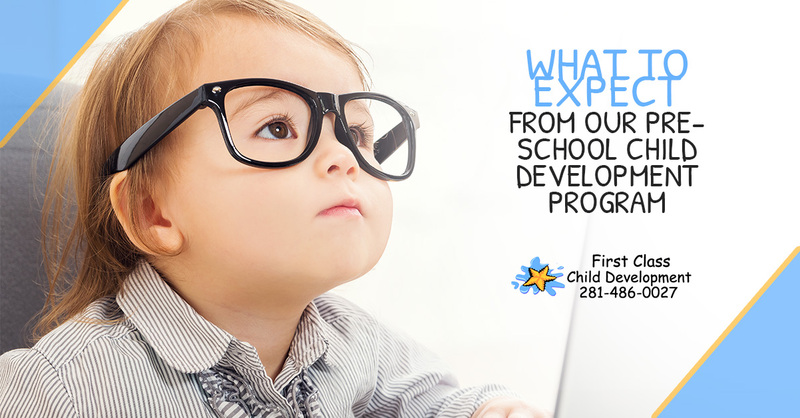 That’s why we’d be glad to chat with you or answer any questions you may have about what to expect from First Class Child Development. Don’t hesitate to contact us because our goal is to be the team you turn to. We’ve been serving the needs of families in the Houston area for nearly two decades now and in that time we have made it a point to learn and grow. With low ratios, degreed teachers, academic accreditation, and more, you can count on us.